The demand for firearms in Libya has brought to light three handguns so far undocumented, at least in the English-speaking world. At least one of these (pictured below) is available in lethal-purpose form, though based upon a blank firing handgun and possibly also produced in that form. It is a sub-compact design, and appears to be a direct copy of a Turkish Atak Zoraki converted or redesigned to chamber lethal ammunition (it is seen firing here). 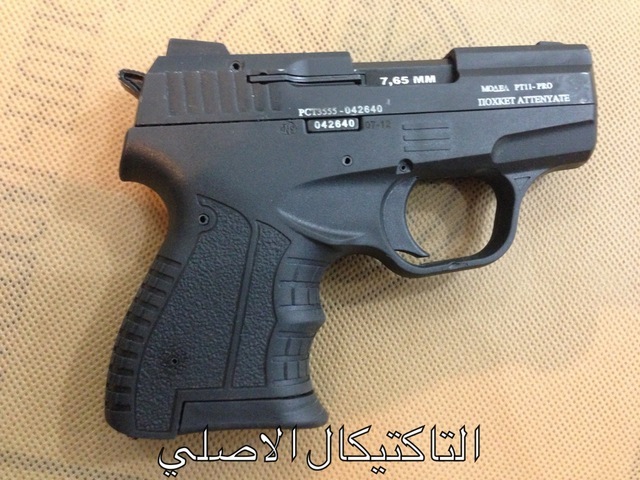 It shares a brand/model name with a second design (see below), claimed to be Serbian and recently spotted by Armament Research Services (ARES) on ‘The Libyan Firearms Market’ (سوق الأسلحة النارية الليبي), a Libyan Facebook page involved in the sale of both blank-firing and lethal-purpose firearms. A source in Tripoli who has previously purchased items from the proprietor, told ARES the transaction process was simple, with exchanges made in person and paid in cash after having seen the merchandise. The shared name of these weapons, inscribed on the slide, is ‘TACTICAL-HULK PT11-PRO’, accompanied by the inscription ‘ПОХКЕТ АТТЕNYATE’. This appears to use a combination of Cyrillic and Latin alphabet letters, and may be a poor attempt to approximate foreign markings. Markings indicate the weapon is chambered for 7.65 x 17 mmSR (.32 ACP), a rather weak handgun calibre, especially when fired from the short barrels seen. The fit and finish of the weapons does not seem much better than many of the blank firing weapons produced in Turkey, particularly on the larger model below. The slide markings on the handguns in photos #1 and #2 may indicate production in 2012. The presence of a serial number printed on a metal plate and exposed through a cutout in the frame belies relatively sophisticated and expensive manufacturing process, and likely indicates that the weapons are intended to be sold in a jurisdiction requiring externally visible serial numbering. The relationship between the two designs is unclear, but given the existence of the Zoraki, would seem to represent an evolution of that basic design, or an attempt by another to capitalise on the name and reputation of the Zoraki. The name ‘PT-11 PRO’ recalls Taurus or Kel-Tec, but neither version owes anything to either of those designs. This appropriation of legitimate firearm branding on dissimilar types is reminiscent of the products of illicit Croatian factories, though we have no evidence to confirm the nationality of these designs beyond Libyan source claims of Balkan origins. The weapons may equally be of Turkish origin. The third pistol, above, shares design cues with, and is apparently a full-size companion to, the second. It shares a similarly chunky polymer frame styling, a distinctive grip texture, and the same characteristic circular designs on the dust-cover. The full-size version also has matching circular cut-outs on the slide itself, and an unusual control mounted on the left side dust-cover, likely a take-down lever. It seems to be a wholly original design, with no analogues in either lethal or blank chamberings. It was being offered for sale on The Libyan Firearms Market for 4,800 Libyan Dinars (LYD), or approximately 3,900 USD. 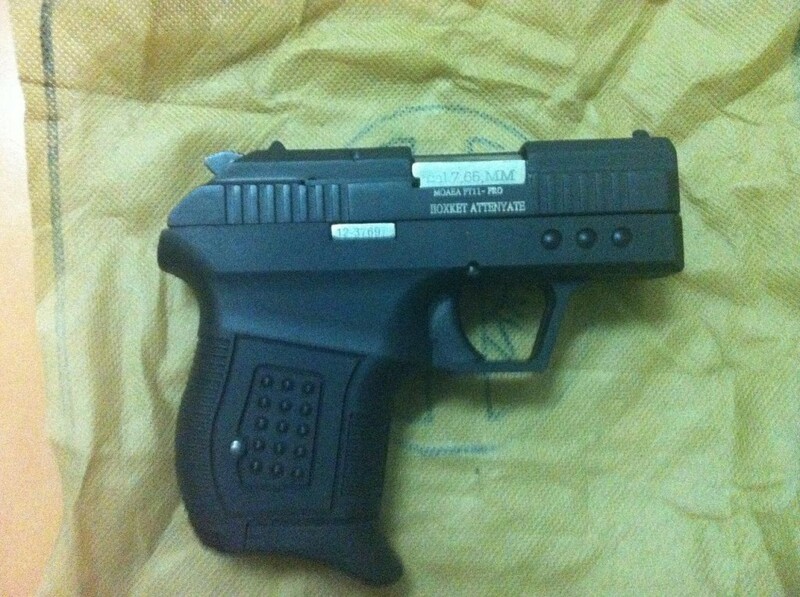 Another version of the handgun pictured previously, this model was being offered for sale on The Libyan Firearms Market for 2,800 LYD, or approximately 2,275 USD. Thanks to Alexander Diehl, N.R. Jenzen-Jones, Hassan Morajea, and Paul William for their input. Update 28/02/2014: Thanks to reader ‘vbk’, who pointed out the smaller handgun appears visually similar to a blank firing model produced by Aral Weapons Ind. Co. of Turkey. It may be that the ‘TACTICAL-HULK’ range are based on different converted blank firing weapons. 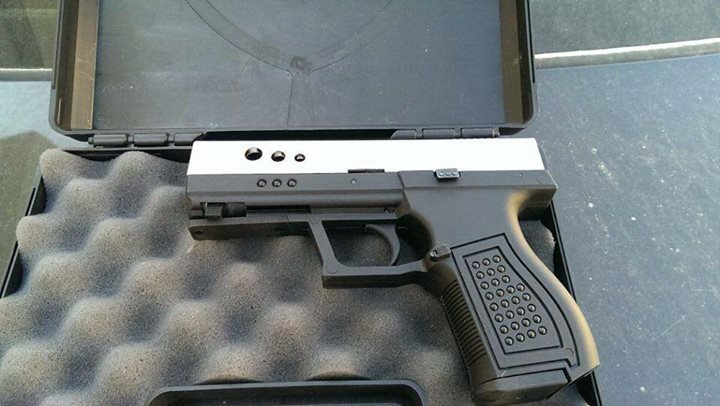 Hi I’m wondering about these unknown handgun called Tactical hulk pt11-PRO, is this handgun safe? Is it true that it was originally manufacturered as a blank firing gun but they modified it’s barrel to be arm firing gun. Thanks. We haven’t examined the firearms in person, or received detailed photos, and cannot make a safety assessment of them at this time. If you have access to these weapons, please get in contact with us. I have access to the pt11-pro version, they are selling it in Jordan for something around USD 900. I am planning to buy one for myself, yet, I need to if know if it worth it before buying it. what can I provide in order for you to assess it ? Any update or more info on the PT11 PRO ?? Second pistol: Aral Weapon ind. Turkish made (model 511 8mm or 9mm PAK blank pistol version). Our thanks for pointing that out! Cca. third pistol Aral Weapons ind. co. ltd.Turkey,Konya city.Grip texture like wie the second pistol. First pistol (Zoraki).Marking on the slide pct -russian standard.Made for Russian export. Nope, those markings aren’t Russian. Someone was fooling around with the Symbol font, typed “Pocket Attenuate”, changed the font to Symbol and put that on the gun. First pistol (Zoraki 906).Marking on the slide,before the serial number: pct 3555.Made for russian market blankpistol or traumatic rubber bullet pistol version.PCT russian standard with russian cirillic letters.Πoxket atteHuate greek,egypt kopt or other mediterran region cirrillic type letters. 2000-3500 USD in Libya?Zink alloy blank pistol converting to live .32ACP ammo?Zoraki 906 9mm PAK blank pistol 60 Euro in Turkey. The lower body of the 1st gun is the zoraki 906 which is made as 9mm blank gun. But the upper part is unknown as a maker which is named as tactical hulk PT 11 pro and also there is PT 12 Pro. No one know if the upper part is converted from blank or already custom made to take 7.65 mm leathal ammo and if if it is safe or dangerous . The problem is alot of people is using it in the middle east and have no idea what it is. In the US alot of guys al ready converted the zoraki 906 and using it with no awarness that it will expole in their hands . 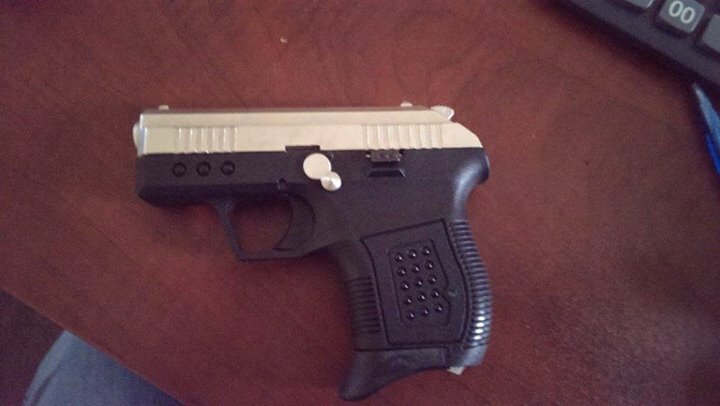 Any one have any imformation please post regarding the upper part of the pistol . 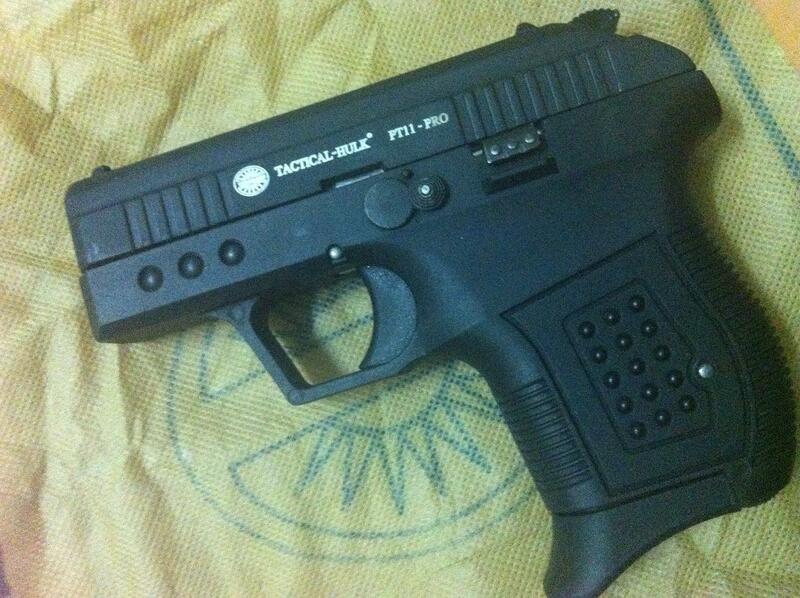 This pistol is said to be Turkish blank firing gun named “zoraki m906” from Turkish “atak arms company” and was modified to expand the barrel to fit real bullet. Wonderful gun sound, but as a real gun it’s going to explode in your hand after four or five rounds.